Many know that Hank Aaron was the first player to tie and break Babe Ruth’s all time home run record. However most don’t know that the historic tying home run came on Opening Day. 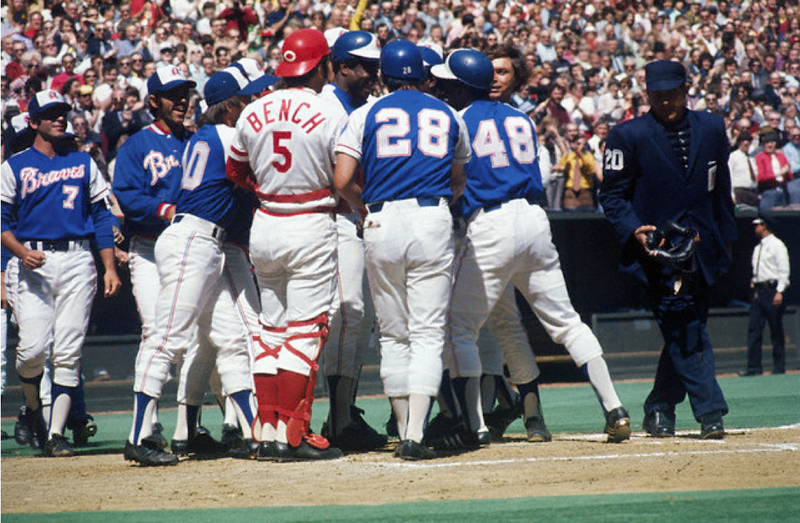 On April 4th, 1974 the Hank Arron and Atlanta Braves played the Reds in Cincinnati, Oh. It was in that game that Aaron hit his 714th career home run. The historic home run came in Hank Aaron’s first at bat of the 1974 season. Jack Billingham was the pitcher that gave up the home run. There was no better place for this incredible moment to happen in Cincinnati. The city is home to the first ever professional baseball team, the Reds. Everyday until 1990 the Reds had thrown the first pitch in every baseball season. Opening Day is even an official holiday in the city, complete with a parade. That great Opening day moment almost never happened. Prior to the season opener the Braves management was worried that Aaron would not only tie but break the record in Cincinnati. They were so concerned that he was going to sit out the first series of the season until the team returned to Atlanta. The Braves were forced to play Aaron in at least two games of the three game series. Hank Aaron would not hit another home run until April 8th, 1974 in Atlanta. That home run would be his 715th and broke Ruth’s all time record. Aaron retired after the 1976 season with the Brewers. When his career was over Aaron had 755 career home runs. The incredible action of week 1 carried into week 2 on Sunday. Week 2 brought many great match ups and answers to questions unanswered in week 1. 2centsworthofsports.com brings you the top 3 stories from the second week of the NFL. Eli Manning and the defending Super Bowl Champion New York Giants suffered a disappointing loss in week 1 to the Cowboys. Anxious to prove they could repeat as Champions, the Giants played the Buccs in week 2 in what turned out to be a crazy game. The Buccs came out strong in the 1st half leading the Giants 24-13 going into half time. The Giants came out of half time only scoring 3 points in the 3rd quarter. The 4th quarter is when the Giants picked it up a notch by scoring 25 points. The Giants defeated the Buccs 41-34. The game was one of the wildest of the first 2 weeks. Eli Manning faltered early with 3 interceptions but made up for it with 510 yards passing and throwing for 3 touchdowns. The 510 passing yards were a career record for Manning in one game. 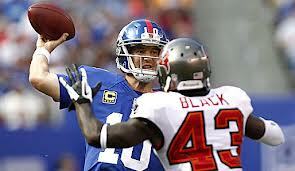 The Buccs looked really strong in this game but lost due to Eli and his comeback heroics. Eli and the Giants showed in week 2 that they are ready to attempt a repeat at the Championship this year. The number 1 overall pick in April’s Draft Andrew Luck came in with high expectations. In week 1 he did not meet them, week 2 was another story. Luck helped his Indianapolis Colts win their 1st game of the season on Sunday against then Minnesota Vikings, winning by a score of 23-20. Luck was 20-31 passing with 224 yards in the air and rushed for 21 yards. Luck scored his first 2 touchdown passes of his career in this game, his first was to Dwayne Allen and his second to Reggie Wayne. More importantly Luck threw no interceptions which was a huge improvement from week 1 where he threw 3. 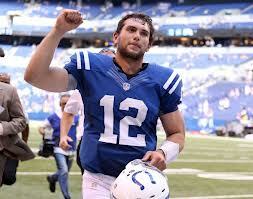 Luck has definitely improved from week 1 and should develop into a really good NFL QB over the course of the season. On Monday Night the Broncos came into Atlanta to face the Falcons in Prime Time. Matt Ryan and the Falcons were victorious and made a statement. The Falcons are likely back to the form they were in a couple of years ago. 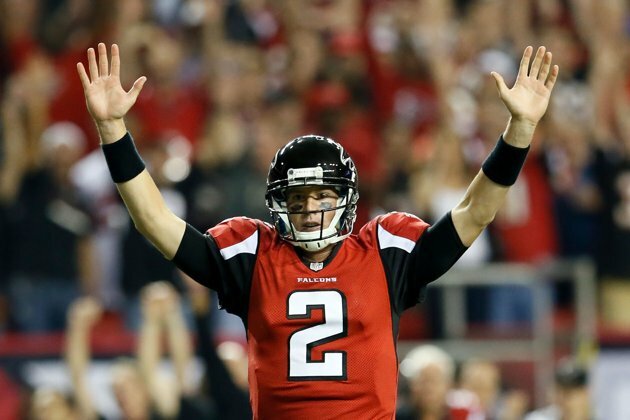 Matt Ryan led his team to the win with excellent passing. Ryan had 219 yards passing and had 2 touchdowns. Manning on the other hand had a rough night, throwing only 1 TD pass and throwing for 3 interceptions. The Falcons scored quickly and went into halftime with a 20-7 lead. In the 3rd quarter the Falcons scored 7 points while the Broncos had 0. In the 4th quarter Manning tried to lead his team to the comeback victory as his brother Eli did on Sunday but could not pull it off. The Broncos were able to score only 14 points in the final quarter. The final score was 27-21 in favor of the Falcons. It was an interesting match up with and even more interesting outcome. The Falcons are going to be a strong team for their NFC foes to compete with this season. 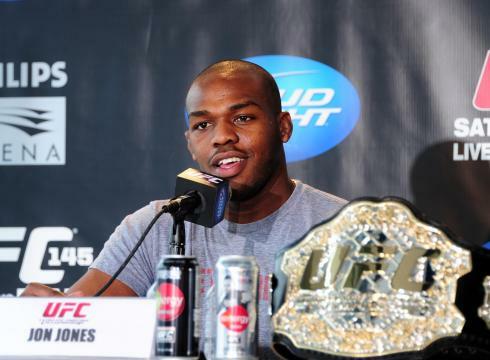 On Saturday morning at 5am EST Jon “Bones” Jones was arrested in Binghamton, New York and charged with Driving Under The Influence. He reportedly crashed his Bentley into a pole and was arrested at the scene of the accident. No other vehicles were involved in the accident. Jones is from the nearby town of Ithica, New York. Jones’ management has confirmed he was arrested for a DUI but have not confirmed the details. Jones is currently the UFC’s Light heavy Weight Champion. He last defended his title at last months UFC 145 in Atlanta. He defeated challenger Rashad Evans at that event. As of the moment Jones is slated to defend his title against former Pride and Strikeforce Champion Dan Henderson at UFC 151 in September. There is no word yet from the UFC of what actions if any that the company will take. This is not a good situation for the UFC from the get go. The UFC will likely face pressure to take action. That could mean a fine or even worse a suspension for Jones. Jones is the one fighter who is very talented, very young and could carry the company through the decade if he can continue to stay healthy. Although he is not very charismatic and has not proven to be a big draw on Pay Per View, he does have a lot of potential to sell them a lot of PPV buys in the Future. The UFC’s primary source of revenue is on PPV. The UFC has had nothing but problems when it comes to fighters who are booked on shows pulling out. A lot events in the last year and a half have seen many fighters pull out due to injuries in training and in a few instances failed drug tests. This may be one situation where a fighter has to be taken out do to bad decision making. With the television ratings declining and their deal with FOX not looking so great, this is a terrible thing for the UFC to have to deal with. The UFC President Dana White has never been one to shy away from talking about a situation. I expect White to address this situation in the next week.